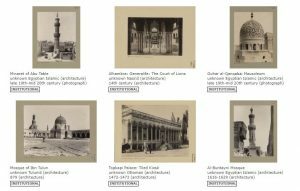 The VRC recently digitized and cataloged 124 historic study prints of Islamic architecture and sites in preparation for a digital teaching project in Professor Holly Edwards course ARTH 222 Photography in/of the Middle East. High-quality scans of the prints have been added to the WCDA VRC Teaching Collection in the Artstor Digital Library. The photographs date mainly from the nineteenth century to the mid-twentieth century. 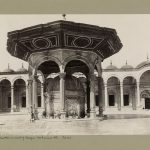 Photographers of this collection include Francis Frith, Félix Bonfils, Jean Pascal Sébah, Policarpe Joaillier, James Valentine, and G. Lékégian & Company. These photographers documented locations such as the Blue Mosque in Turkey, the Alhambra Palace and Complex in Spain, St. Catherine’s Monastery in Egypt and many more. Other regions that were photographed include Syria, Israel, and India. The selection is part of the Art Department’s Historic Photographic Study Print Collection of art and architecture, numbering nearly 4,500 prints.